It has finally happened. “The New Starbucks” has come up with a solution to the much-despised (especially by myself) “sippy cup lid.” I can now confirm the availability of of a green plug with a rod that fits somewhat securely on the lid’s opening. Much in the fashion of Apple’s Mighty Mouse, where the computer manufacturer came up with a two-button mouse that still technically is a one-button mouse, Starbucks obviously hasn’t wanted to admit its lid’s major shortcoming. Maybe this “New Starbucks” idea isn’t so bad. They might have killed the breakfast sandwich, but this new lid and the new Pike Place Roast, which doesn’t charcoal your mouth nearly as much, do represent significant improvements. Maybe this is Starbucks punishing me for increasingly defecting to Dunkin’ Donuts for coffee. In that category, Dunkin’ has caught up. However, their breakfast sandwiches are nothing to write home about and overly laden with cheese. This observation might be skewed by the fact that my sandwich of choice at Starbucks was the Reduced-Fat Turkey Bacon Sandwich (with reduced-fat cheese). Anyway, the removal of these sandwiches, to me, is one of those fanciful “we identified the problem” fixes. Apparently this decision will “restore” the smell of coffee at Starbucks. I’ve been to over 30 Starbucks in New York City, and not one smelled like a elementary school cafeteria during lunchtime. This decision will do nothing for Starbucks. Of course, this move is coupled with ones that may actually make a difference: $1 coffees and free refills. Then again, wouldn’t this just destroy the so-called “Starbucks experience” just like the breakfast sandwiches supposedly did? My guess is that Dunkin’ Donuts will continue to eat away at Starbucks. They already are in New York City. And, as we all know, they have a much better lid! When is Starbucks going to redesign their lid? I complained about this over a year ago and mentioned the specific location of a Starbucks where I was burned, spawning a tirade of hate mail by that location’s baristas. Since then, I have been burned and stained by Starbucks coffee on several occasions. Dunkin Donuts has had a new lid out for around two years now, that snaps shut. It’s about time Starbucks comes up with something similar. 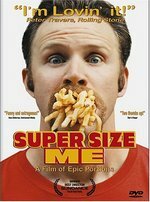 I took some time off today to watch Morgan Spurlock’s Supersize Me, something I like to do regularly when I think I’m eating too much fast food. It is pretty effective. As a college student, I stereotypically eat unhealthy most of the time. A good 90 percent of my meals are consumed at Kimmel Food Court, three blocks away, where my choices are Dunkin’ Donuts, Sbarro, Burger King, KFC, Taco Bell, Häagen Dazs, some bad sandwich place, and a very limited Chinese grill. In order to improve and diversify my diet somewhat, I subscribed to an off-campus meal plan this semester, which lets me eat or order from over a dozen places, most of which are on Marshall Street, four blocks away. I only chose a very limited meal plan for that though, so I probably only had somewhere around 25 meals off campus, all semester. I really hope I end up marrying a vegan chef someday, like Morgan Spurlock is, or at least develop an interest in healthy cooking. The way America’s nutrition is heading is absolutely disgusting… The half-gallon (2-liter) soda cups, the Triple Whopper (quite tasty) and its near equivalent breakfast sandwiches… It’s ridiculous. If I didn’t walk the great amount I do almost nearly every day, to/from class and at work), I’d be horribly obese. No wonder that fast food, coupled with cars and delivery service, has achieved this. Super Size Me brings in so many facts, that really drive home the argument. Just about all food products marketed to kids on TV are for fast food, sugared cereal, or soft drinks. McDonalds serves as the “community playground” with its PlayPlaces. Too bad its Happy Meals aren’t that easily burned off climbing and sliding for twenty or so minutes. Then of course there are school lunches. When I was in elementary and middle school, you were basically forced to purchase a somewhat balanced lunch. Spurlock visits schools where kids are allowed to just purchase fries or a pile of Little Debbie snacks. One great moment is when a lunch supervisor mentions that the school recently got rid of soft drinks, upon which Spurlock notes that there is just as much sugar in the Country Time Lemonade they were selling. Even poor schools, receiving nearly all their food in boxes from the federal government, are receiving nothing but disgusting junk. As if that wasn’t enough, schools are cutting recess and physical education. Isn’t this a wonderful combination!? Spurlock’s movie was “rebuttaled” several times by journalists and other independent filmmakers. 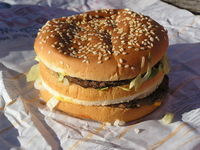 All ate at McDonalds for 30 days, but limited their calorie consumption. Too bad most Americans don’t do that. Anyway, so now I’ll be scared of fast food again for a couple days. It can’t hurt.